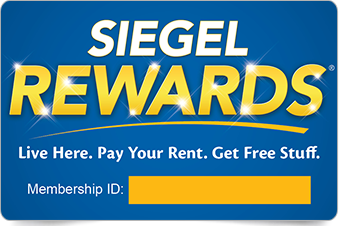 Siegel Rewards® - Siegel Suites - Get Free stuff for paying rent! It’s never to late to join! Visit the front desk at your Siegel Suites Select® location & one of our friendly representatives will get you signed up! Plus… refer your friends to receive bonus points! Visit the frequently asked questions page to find more information about our Siegel Rewards® program. Get REWARDED every time you stay with us by joining the Siegel Rewards® Program. There are countless reasons to live in of our Siegel Suites properties: low cost and spacious studio, 1 bedroom & 2 bedroom suites in prime locations; no leases or commitments to tie you down; free extras like premium cable TV, utilities, fitness centers, parking, pools & more. With the Siegel Rewards® program, you’ve really hit the jackpot. Just by staying with us, you’re a guaranteed winner! All of our locations qualify. Just by staying with us, you’ll earn points. You can use your points to pay for your stay or to treat yourself to food, movies, gift cards, TVs & more. At Siegel Suites, the longer you stay, the more you earn. After 90 days, you’ll start earning more with Bonus Points. You can even earn points by referring a friend to us. Cashing in your points couldn’t be simpler. Not staying with us yet? Call us toll-free at 1-888-328-0192 to reserve your apartment.